To mark the milestone of the 50th dead thing, it’s time to tackle one the big ones: mattresses. Dead mattresses are everywhere. 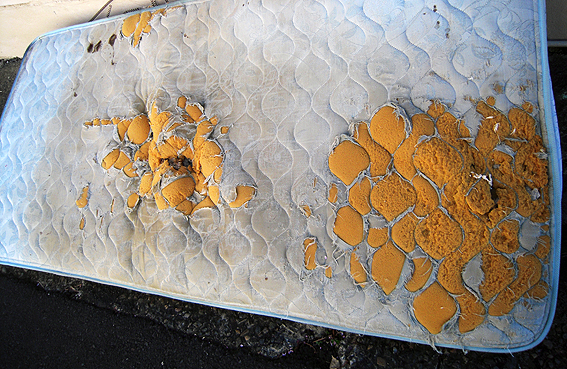 With the possible exception of televisions in the run-up to the digital switch-over, mattresses have been – and still are – the most widespread and frequent of laneway losses. The ones collected here represent the merest fraction of the total number encountered over the years; I gave up recording them long ago because they are just so numerous and, to some extent, indistinguishable. Clearly they are so ubiquitous because, by and large, we all use them. And we use them regularly – say, at least once nightly – and for long periods too. Hours, days, months, even years are spent in the company of our mattresses as we slumber, toss and turn, stir drowsily and roll over. Inevitably though, spending such extended periods of time together takes its toll and, given that nothing lasts forever, it is perhaps no surprise there is a steady stream of discarded kings and queens, doubles and singles on our streets. But it’s not just the sheer volume of the worn-out and unwanted, however, which makes mattresses so notable. There are few man-made objects with which we are more intimately connected over the course of our lifetimes than the mattress. It is one of our most private possessions, part of the inner sanctum of our bedrooms where, for years at a time, it is kept covered and shrouded. It is the place where we spend a large part of our lives, the stage for many of our most intimate experiences and, ultimately, the thing on which many of us would prefer to die. All that counts for little in the end though. In the final moments, when what has been can no longer be sustained, the mattress [originally from the Arabic taraha – to throw] is stripped bare and exposed to the elements, expelled and denuded in the eyes of the world, naked for all to see. It is a startling, callous casting out, almost Lear-like in its severity. Some of those thrown out appear practically new, as bouncy and well-padded as the day they were born, but there are many others that speak rather too plainly of the mundane, corporeal reality of human existence – the weight, the friction, the gradual oozing and seeping of the flesh. More than most dead things (and there is some stiff competition, so to speak), the mattress hints at our own mortality, preserves it as little more than a smear, a mysterious darkening, a random stain of unknown origin. There are other more practical reasons as to why there are so many mattresses on the streets. With a bit of organising, the mattress is one item the local authority will come and take away. There are also recycling schemes which will collect mattresses and reuse all the component elements including the steel, wood, padding and fabric. So while there are undoubtedly many mattresses out there that have simply been dumped (one unsourced estimate says 1.25 million in Australia per year), many others are also merely in limbo or bardo, waiting to commence the next stage of their journey.